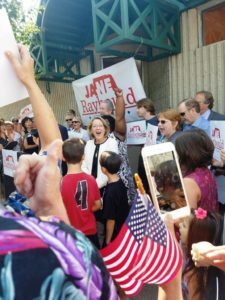 On Friday, August 25, the Lincoln Journal Star and Omaha World Herald broke the news of Jane Raybould’s candidacy for US Senate. 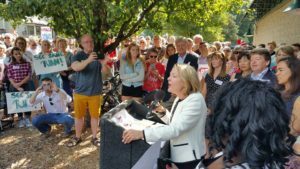 “’I have never shied away from a fight,’ said Raybould, who is a vice president at her family’s grocery store business. 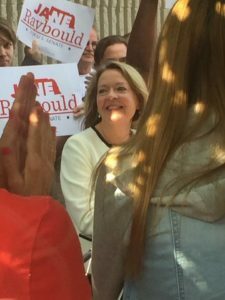 On Saturday, August 26, Raybould officially kicked off her campaign with a rally outside her father’s first grocery store, the original Russ’s Market in Lincoln, NE. Watch the full video of Jane’s speech. Watch coverage of the kickoff from KLKN. Watch coverage of the kickoff from KETV. She finished the day with a stop at the Nebraska State Fair where she met with Nebraskans from every corner of the state and was interviewed by NTV News out of Kearney.